I entered the giveaway contest for this book with my husband in mind, and he was SO excited when I surprised him with the book when it came in the mail. He's thoroughly enjoying it. Though he loves basketball, he doesn't usually read non-fiction, but this book is definitely keeping his attention. Thank you, GR, for the giveaway! I originally gave this two stars, but I think it was because I'm used to reading fiction (action, climactic scenes, etc). This is a very factual account and it wasn't all that exciting of a read. However, I'm raising my rating to three stars because it's all I've talked about this week so it is definitely interesting and worth a read. Very interesting, insightful and fun (and literally at times laugh out loud funny) read re the (hard to argue) greatest team of all time. Four stars rather than five only because, well, given the subject matter not like it could have real depth. I can never get enough of this team, and Jack McCallum is fantastic. 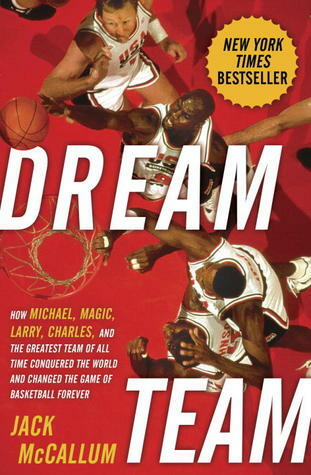 If you like basketball even a little bit, read this book. Good behind the scenes look at an exciting time. A bit dated in terms of the portraits of boys being boys but still a good read.